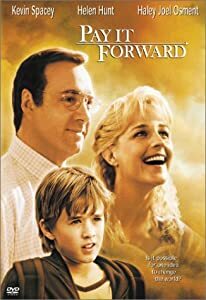 Pay it Forward - what a lovely film. For those who haven't seen it - you should! A boy tries to change the world for the better. Pay it Forward is all about passing it on. Instead or paying "back" someone for a good deed they instead do a good deed for 3 more people & so on & so on. Spreading the good deeds around for all to enjoy & benefit. Watch the movie it could bring a tear to a glass eye - my description is some what lacking but you hopefully get the idea. I first came across this in blogging land on Ashley's blog It Is What You Make It. I was a little too late to become one of her lucky 5 but then I came across it again on Rebecca's blog Happiness is Taylor Made & was very lucky to sneak into her lucky 5! Here I am holding up my side of the bargain, the catch so to speak. I am Paying it Forward. So this is all about Snail Mail - who doesn't still love a wee letter landing on their door mat! The first 5 people to comment with their email will receive from me, sometime in this calendar year a letter or card and a surprise gift from me! There will likely be no warning, it will happen when the mood strikes me. I am happy to post internationally! Don't hold back on the comments, I don't mind admitting I'm terrified I won't get 5 but I am putting it out there anyway!! Hi! :) I love getting snail mail :D hehe! I also signed up for Rebecca's over at Puddle of Grace (now used to be taylor made happiness)I have yet to post my pay it forward post so I shall join yours too :) I hope i am allowed to lol! Oh and I'm sure it wont cost much in postage hehe!